Smith, Shirlee Anne. "Rupert's Land". The Canadian Encyclopedia, 13 July 2018, Historica Canada. https://www.thecanadianencyclopedia.ca/en/article/ruperts-land. Accessed 22 April 2019. Rupert's Land was a vast continental expanse — a third of what is now Canada — which from 1670–1870 was the exclusive commercial domain of the Hudson's Bay Company. Portrait of Prince Rupert by Sir Peter Lely (courtesy Hudson's Bay Co). Rupert's Land was a vast continental expanse — a third of what is now Canada — which from 1670–1870 was the exclusive commercial domain of the Hudson's Bay Company. Three years after Confederation the government of Canada acquired Rupert's Land from the Company for $1.5-million: the largest real estate transaction (by land area) in the country's history. In the late 17th century, the fur trade in beaver pelts was growing in commercial importance in North America. Yet it was difficult for traders to reach the rich trapping grounds north of Lake Superior and beyond, without making difficult overland journeys from the Great Lakes or the St. Lawrence River. Two French explorers, Médard Chouart des Groseilliers and Pierre-Esprit Radisson, wanted to establish a trading base on the shores of Hudson Bay, the northern "frozen sea" few Europeans had ever seen, but which offered an easier sea-route into the heart of the continent's best fur country. 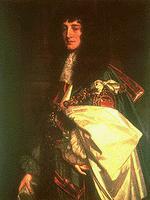 Des Groseilliers and Radisson failed to interest the French government in their idea, so they took their scheme to England, where a group of entrepreneurs and noblemen — including Prince Rupert, the King of England's cousin — persuaded King Charles II to support the venture. In June, 1668 two small ships were dispatched from England. One, the Nonsuch, reached Hudson Bay in September, with des Groseilliers on board, and he and his partners spent the following winter successfully trading with the Cree on the southern shores of James Bay. The Nonsuch returned to England with a large cargo of furs. Additional ships were dispatched, with similar successful results, and in 1670 the "Governor and Company of Adventurers of England Trading into Hudson's Bay" (the Hudson's Bay Company, or HBC) was created under a royal charter signed by Charles II. By today's standards, the charter was breathtaking in reach. It gave the HBC and its merchant governors exclusive rights to trade —and to colonize — all the lands containing rivers flowing into Hudson Bay, the entire Hudson Bay drainage system. This amounted to an enormous territory in the heart of the continent: what is today northern Québec and Labrador, northern and western Ontario, all of Manitoba, most of Saskatchewan, south and central Alberta, parts of the Northwest Territories and Nunavut, and small sections of the United States. This private estate stretched from the Atlantic to the Rocky Mountains, and from the prairies to the Arctic Circle. 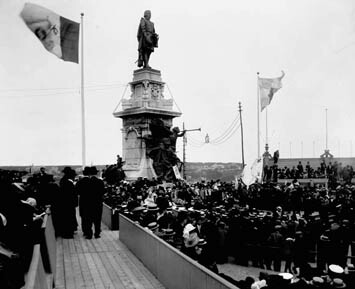 The area was five times larger than France, and all 3.9-million square kilometres of it was named Rupert's Land, in honour of the King's cousin, who became the HBC's first governor. The HBC had complete control of the territory. Almost no thought was given to the sovereignty of the many Aboriginal peoples that had lived there for centuries. The HBC established forts and trading routes through much of the territory. The Cree, Assiniboine and other groups who supplied the Company with furs, or who acted as middlemen for other Aboriginal fur suppliers, were incorporated into the growing trading economy or directly employed by the HBC. The fur trade changed the Aboriginal economy. Rather than hunting and trapping for subsistence, people now trapped in exchange for trade goods, including guns and alcohol. 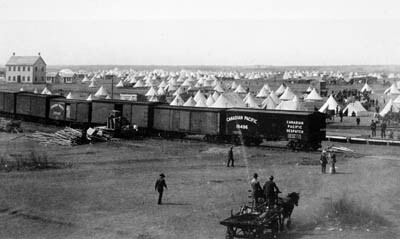 Rupert's Land also became home to a new people of mixed European and Aboriginal heritage, the Métis, who were active participants in the fur trade, and who helped populate the Red River Colony (at present-day Winnipeg), which was carved out of Rupert's Land as a frontier settlement, initially for Scottish migrants, in 1811. For 200 years, the HBC built trade posts on most major waterways including the Rupert, Moose, Albany, Severn and Churchill Rivers. The first western inland post was erected at Cumberland House on the Saskatchewan River in 1774. By 1870, there were 97 posts within Rupert's Land. HBC traders were responsible for much of the exploration and mapmaking of the territory. The trade also made possible the spread of Anglican and Roman Catholic missions into parts of Rupert's Land. 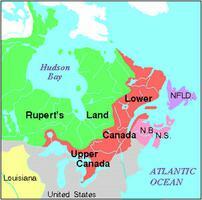 In 1867, the Dominion of Canada was formed out of the Confederation of Ontario, Québec, New Brunswick and Nova Scotia. The new country was led by Prime Minister Sir John A. Macdonald, whose government was increasingly eager to annex Rupert's Land into the Dominion. This came partly from a desire to expand the frontiers of the nation to the north and west, but was also a response to fears that the United States, which had purchased Alaska from Russia in 1867, was interested in annexing Rupert's Land for itself. At the same time the HBC's governors were increasingly aware that no private company, even one as powerful as theirs, had the funds to administer a vast territory increasingly becoming a place of European settlement, rather than simply a source of furs. And no longer could the HBC claim the moral right to govern such an area. The question then became: how much was Rupert's Land worth, or more precisely, at what price could the HBC be persuaded to give up its monopoly charter? The US had paid $7.2-million to the Russians for Alaska; the HBC believed Rupert's Land was worth as much as $40-million. Canada did not have that kind of money, but the US did. The British government, however, was also wary of American expansionism, and would not allow any sale to the United States. Britain pressured the HBC to enter negotiations with Canada for the transfer of Rupert's Land. Two ministers in Macdonald's Cabinet, George-Étienne Cartier and William McDougall were sent to London to come up with a deal. After six months of negotiations, the HBC agreed to transfer Rupert's Land to Canada for the bargain price of 300,000 Pounds, or $1.5-million, in addition to continued HBC title over various trading posts, and five per cent of the territory — mostly fertile prairie farmland. The HBC signed the deed of transfer surrendering its territory to the British Crown on 19 November 1869; the Crown, in turn, ceded the land to Canada. However, because of the political disruption of the Red River Rebellion, the transfer did not become effective until 15 July 1870. 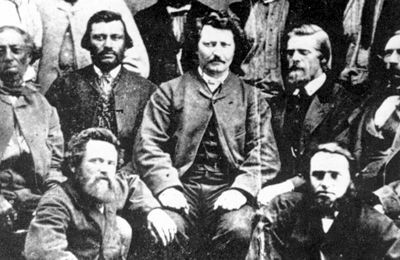 That same year, as a result of the political arrangements brought about by the Resistance, the province of Manitoba was admitted into Confederation. Meanwhile the Rupert's Land purchase prompted the Canadian government to negotiate seven treaties with Aboriginal nations within the territory, acquiring their consent to the Crown's sovereignty. Geographically, the Rupert's Land purchase transformed Canada from a modest country in the northeast corner of North America, into an expansive nation stretching north and west across the continent. Rupert's Land would eventually be apportioned out between the provinces of Québec, Ontario and Manitoba, and later, upon their creation, to Saskatchewan, Alberta, and the Northwest Territories. Canadian Museum of HistoryThe Canadian Museum of History (formerly the Canadian Museum of Civilization) offers an extensive collection of online exhibits about Canadian history and culture.